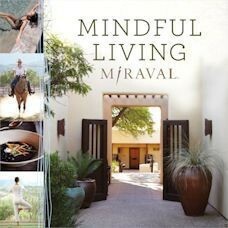 Mindful Living, the new book compilation by Miraval, the world-renowned resort and spa in Tucson, Arizona, is a sumptuous, insightful and inspiring read and the next best thing to actually being there. Each of the 12 chapters illuminates a quality essential to mindful living such as growth, joy, balance, and meditation. Included are in-depth articles on each subject written by a specialist at Miraval, as well as an exercise, mediation, recipe and spa treatment that you can create or engage in at home. Everything at Miraval revolves around the practice of mindfulness, a state of awareness and appreciation of the present moment. The book uses the 12 months of the year as a guide and delves deeply into one tenet of mindfulness in each chapter. For example, August is all about overcoming obstacles. Dr. Tim Frank, a Naturopathic MD, says ‘challenges can be a gift, but so often we get stuck, either from the trauma of our past or the challenges of the present, and we need some guidance and healing in order to grow and move forward.’ He has created a treatment called Spirit Flight, one of the unique and most popular healing modalities at Miraval. The treatment incorporates therapeutic massage with the healing practices of Shamanism and drumming, as well as acupuncture and craniosacral therapy which restore the body’s energy back into balance and alignment. As a practioner of mindfulness, I was delighted to learn some new guided meditations and visualizations to incorporate into my own practice. There are over a dozen different types of meditations described in the book and simply seeing it on my coffee table is a daily reminder for me to use even the simplest tools of mindfulness like connecting with my breath in order to remain focused and relaxed. Just flipping through the pages and gazing at the beautiful photos of the stunning Sonoran desert and grounds of the resort is a treat for the senses. Mindful Living is truly a tremendous source of insight and inspiration, a catalyst for living your best life and achieving the mental, spiritual, nutritional and physical fitness celebrated at Miraval. FTC Disclosure: I received this product for free from Hay House Publishing for this review. The opinion in this review is unbiased and reflects my honest judgment of the product.